Jenny became the Executive Director of Living River September 1, 2018. Jenny has a strong background in Education, in the Presbyterian Church (USA) and several years of experience with summer camp at Living River. She was most recently the Director of Christian Education at First Presbyterian Church, Tuscaloosa and a Certified Christian Educator within the PC(USA). Jenny retired after 26 years in public education serving as a teacher of gifted students, Assistant Principal, and Principal in Tuscaloosa City, Shelby County, and Tuscaloosa County School Systems. She also worked in teacher education and administration at The University of Alabama. In her tenure she worked with all ages preschool through college. After graduation from the University of Montevallo, Beth served as the band director at Pizitz Middle School and the assistant band director at Vestavia Hills High School, in Vestavia Hills, Alabama. Later she moved to Los Angeles, California to pursue a career in film production. There she remained for 25 years primarily producing national television commercials. The career in film production offered her travel opportunities all over North America as well as many international locations. Eventually she returned to Alabama and moved into the field of publishing. She was the managing editor of Recovery Campus Magazine and the managing editor and food editor of Tailgater Magazine. Back in Alabama, Living River seemed to be calling her name. The Cahaba River and the Cahaba lilies were fascinating to Beth even as a child growing up in Montevallo. It was her dream to one day be a steward of the Cahaba River. Beth is pleased to now have a connection with the Cahaba through her work at Living River. Hey there, my name is Beckie Hamrick. 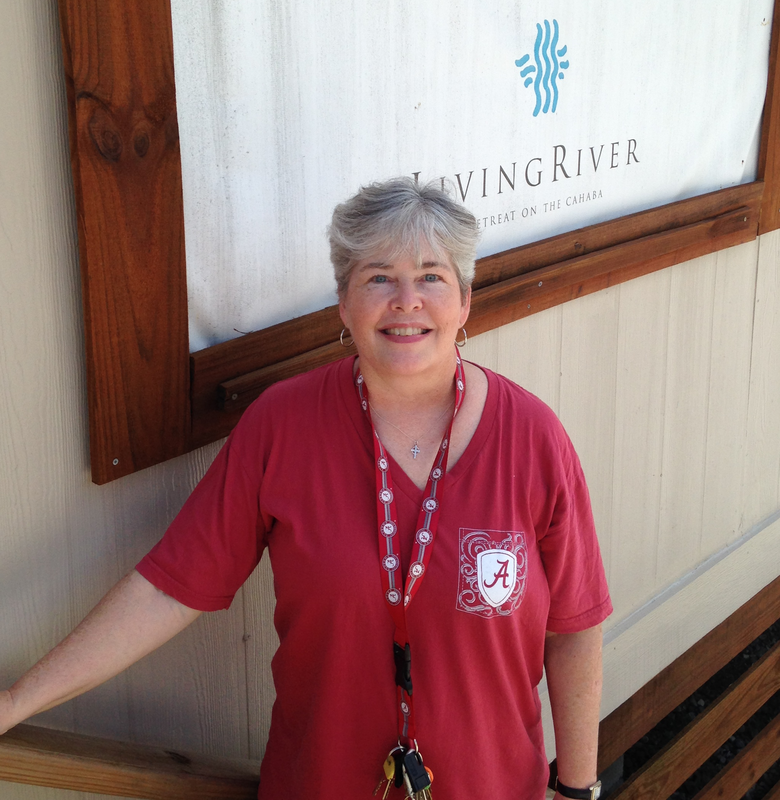 I am the Kitchen Manager at Living River: A Retreat on the Cahaba. I grew up in Alabaster, AL. and currently live in Montevallo. I have three wonderful children and a supportive husband. I love camping, fishing and spending time with the family. I have lived and traveled from Florida to Canada and Texas, and back to North Carolina. I love getting behind the wheel and just going. You never know who you may meet or what you may see. I absolutely love my job. I get to work with a large variety of people from many different places. I am in one of my favorite places, the woods, surrounded by the most beautiful river in Alabama, the Cahaba River. Who could ask for more!